A police researcher, using a newly developed camera, solves the murders of a renowned scientist and the prime suspect in the scientist's death. The theft of a series of scientific documents and equipment become perplexing with the only clue being unexplained time shifts that occur at the time the items went missing. The 3 Stooges are cleaners at a spaceport when they accidentally take off and land on Venus. The boys encounter a talking unicorn, a giant fire breathing tarantula and an alien computer that creates three evil duplicates of the Stooges. 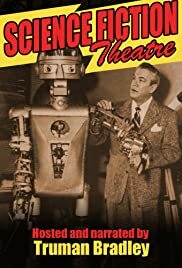 This terrific, imaginative sci-fi anthology TV series was the first intelligent, dramatic sci-fi anthology series made for television, and lasted two seasons, 1955-1957. It was produced by legendary sci-fi and nature film producer Ivan Tors, for Bernard Ziv, of ZIV-TV Productions, and featured well-written half-hour episodes, many based on sci-fi short stories from sci-fi pulp magazines of the 1940s and 1950s; what it lacked in visual effects was often made up for by fine writing, acting, production values and direction. Host Truman Bradley was perfect to announce each eerie story of the week, as well as add a few words at the end of each program on how science could solve a mystery. Underrated by today's standards, this was one of TV's finest dramatic series of the 1950s, featuring many famous B-movie stars in fascinating roles. Highly recommended!